Author: Theris A. Touhy DNP, CNS, DPNAP, et al. Today, the expectation is that all nurses will be prepared to care for the growing number of diverse older adults and have the knowledge and skills to promote healthy aging for people of all ages. 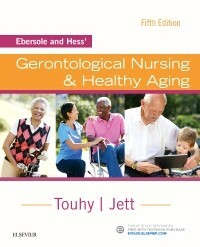 Ebersole & Hess' Gerontological Nursing and Healthy Aging is designed to provide the knowledge nurses need to play a key role in making this happen. Designed to facilitate healthy aging regardless of the situation or disease process, this text also features information on long-term care, evidence-based practice boxes, safety alerts, and careful attention to age, gender, and cultural differences. “I recommend it for any nurse in any setting. There is practically no setting other than peds that would not be able to apply this information." "This course is current and very informative."